Ever controversial, BrewDog is planning to open a craft beer bar on the USA/Mexico border, making a physical statement about its values of “collaboration and inclusivity”, alluding to US President Donald Trump’s plans to build a 1,000 mile wall between the two countries. Named ‘The Bar on the Edge’, the exact location of the remote bar remains a secret, but will aim to reflect the Scottish brewer’s ambition to expand to the “farthest reaches”. All BrewDog has said is that half of the bar will be in Texas and the other half in Chihuahua, Mexico, and that it will be built out of old shipping containers. The geographical border will be represented by a dotted line across the centre of the bar and along the venue’s outdoor seating area, with US beers served on the Mexico side and Mexican beers on the US side, as well as BrewDog’s range of craft beers, brewed in Columbus Ohio. 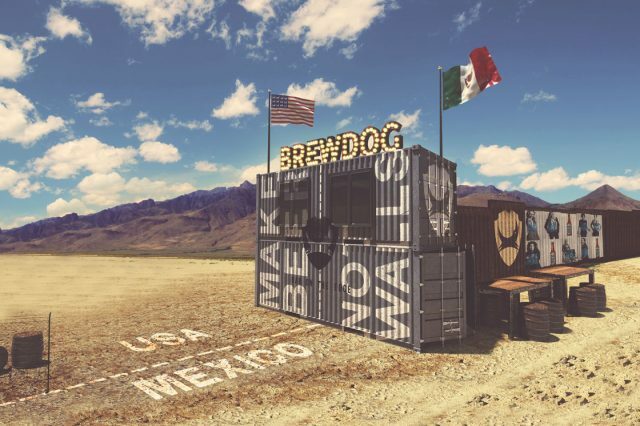 “Beer has always been a unifying factor between cultures – and our business was born from collaboration and an inclusive approach – so we thought it would be fun to place the bar a few feet further to actually cross the US-Mexico border too,” said James Watt, co-founder at BrewDog. Although the bar will be nowhere near any regular footfall, BrewDog hopes it will become a “magnetic pole” for craft beer fans on both sides of the border to come together. The announcement will be celebrated with a Tex-Mex craft beer event at the brewery’s DogTap taproom in Columbus, Ohio, this weekend, with beers from Texan breweries Alamo Beer Company, Brash Brewing, No Label Brewing, 512 Brewing, Copperhead Brewing and Buffalo Bayou set to feature alongside craft beer cocktails with Mexican mezcal and Tequila. You rock. Ever since the first bottle of punk IPA. Respect.